The Insurance Institute for Highway Safety reports eight out of the top ten most commonly stolen vehicles are GM trucks. 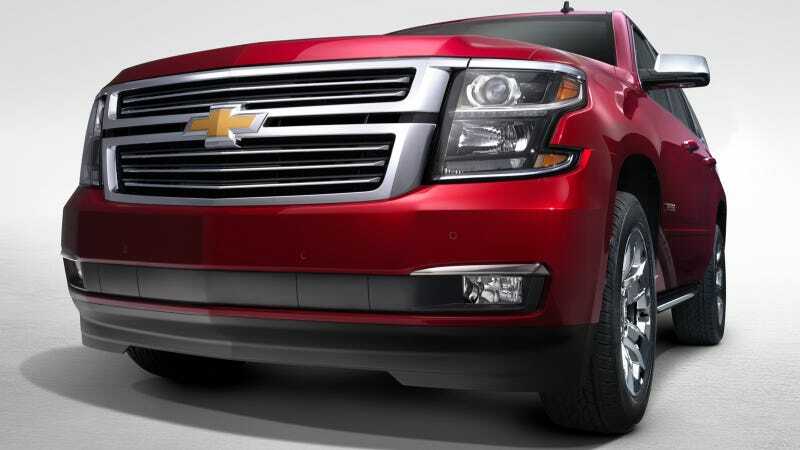 To assert the issue, the 2015 Chevrolet Tahoe will be fitted with a host of new antitheft measures to keep their most popular products from ending up on KTLA police chases. In what General Motors Vehicle Security lead Bill Biondo describes as "a layered approach to vehicle security," new standard features on the 2015 Tahoe include a steering column lock that deters push-away and tow-away theft and side cut keys that deter lock picking. Entry of potential thieves will be further deterred beefier lock cylinders and shields in the doors to block "slim jim" style forced-entry tools. GM has also added hidden storage compartments including (thieves, scroll down very fast) one behind the infotainment screen. Third-row seats will now be bolted down, as apparently they're a hot commodity. They do however fold flat for transporting cargo. For those who really want to lock down their rigs, Chevrolet's offering a Theft Protection Package on the Tahoe LT and LTZ that features glass breakage sensors, interior motion sensors, and a tilt sensor to trip the alarm if the vehicle is lifted off the ground or broken into. Chevy also claims "additional features reinforce key control systems to make it more difficult to start or move the vehicle without an authorized key" but that sounds a little vague to me. I'm sure this tech will be integrated to the Escalade and GM's pickups, which are notoriously targeted by thieves.